NEW YORK (CNS) — The philosophical point of the “The Lego Movie” is turned on its plastic head in the film’s console counterpart. This is a good thing, even if it does make “The Lego Movie Videogame” (Warner Bros. Interactive Entertainment) a bit predictable. In the big-screen original, a controlling authority figure, President Business, tries to stomp out all creativity by not letting other characters build what they want. Instead, he insists that everything be “normal” in his Lego world; nothing too strange, incongruous or offbeat can be permitted. Eventually President Business comes to understand that there is joy in constructing eclectic and crazy works of toy art — and that the whole point of amusements like Lego is to let one’s imagination run free. The video game takes the opposite approach: It’s about fashioning some order out of anarchy. This is sensible, since gameplay devoted to randomly assembling whatever material is handy wouldn’t have the goal-oriented drive necessary to sustain interest. Players can adopt the personas of different characters from the movie, all of whom have varied abilities that come in handy for different tasks. Emmet, the everyman hero of the film, can drill on his own but requires instruction pages to achieve anything more advanced. Master Builders like Vitruvius and Wyldstyle, by contrast, can simply grab big piles of Lego pieces and quickly put them together. Batman and Superman make appearances. So, too, does Green Lantern; he’s the only character capable of building green objects. The gamer progresses through 15 levels by drilling, demolishing, rebuilding — and avoiding the swarming Micro Managers and larger toy monsters that try to block his or her passage. A successful build allows access to the next level, and, ultimately, to “The Final Showdown” with President Business himself. The graphics are bright and fun, and the music and voice work are wittily self-aware and full of pop-culture references. There is no sexual content, and the violence gets no worse than stacks of Legos being knocked over. However, there are some technical problems: Characters can get stuck, and the instruction manual is terribly inadequate. 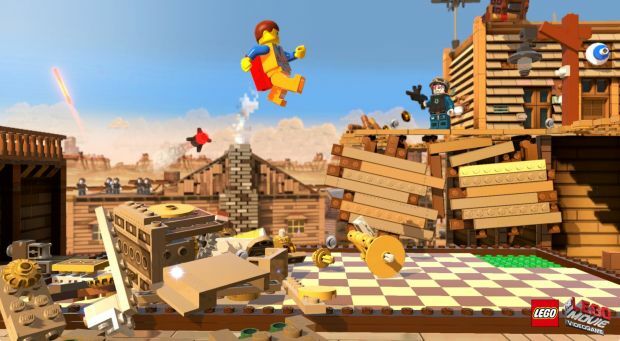 While not much direction is needed to enjoy the original Lego toys, which easily snap together, their electronic iteration should have included at least a rudimentary outline of the purpose of the game, and the tools needed to play it. In the absence of such guidance, parents may be left confused — and children frustrated. Played for review on Playstation 3 and PSP Vita. Available on all gaming platforms.